Parallel was the perfect book to sit at home and curl up with and forget about those looming exams coming your way; was light enough not to be too much of a distraction, but had a depth to it that made you constantly intrigued. The concept of a parallel universe was the main reason that i enjoyed this book, and i loved the idea that two realities could collide and intertwine. The story was told from alternating points of view: Abby’s perspective in the present, and Parallel Abby’s perspective in the past, which at first i found hard to get to grips with but eventually worked it out; although sometimes i'd be reading and be like 'huh' who's perspective is this? and have to flip back a few pages to check..i don't think that was any fault of the author's though..probably just because i have a brain like a sieve! I especially loved the way that every small thing Abby did, changed her 'future'. It made me think about all those 'insignificant' things that happen in daily life that you think nothing of, but in reality - well, in Abby's world - these were major factors in how her life 'played out'. I have to admit Abby slightly annoyed me though. She was so shallow such a girl. She got jealous over the littlest things and made mountains out of molehills and it just made me want to reach into the book and shake her. She lied a lot to her friends and i didn't like how she would be with one 'guy of interest' and be sure he was 'the one for her' then switch 'lives' and be determined that they were made for each other..I never really connected with her and i think the reason for that was because the book was constantly switching perspectives, so the reader never really got to really grasp her personality. The romance..was..not my favourite part of the book - partly because half the time i couldn't really tell them apart. They felt so similar to me! I loved both Fiona and Caitlin though. Caitlin was so refreshing - practical and down to earth and willing to take time to sort through things to work something out, unlike Abby who just jumped straight into a conclusion without stopping to think of how she got there. The end was..satisfying. I'm not a fan of cliffhangers so i'm grateful this didn't have one. It just left a blank, for the reader to fill in and i have to admit, i wasn't expecting the twist at the end! I loved the overall 'moral' or message that the author lets the reader take away with: that no matter what path you take, you'll always end up where you're mean to be. The author did a great job of explaining the concept of the parallel worlds and answered every question throughout the story to avoid any confusion, because i actually managed to get to grips with the whole idea...which is..shocking to say the least because i am terrible at getting my head around 'complicated' things. The only question the author didn't really answer was why Abby was the only person to have this happen to her: which i think is very important to understand so i am kind of disappointed with that. The path doesn't dictate the destination. There are detours to destiny, and sometimes that detour is a shortcut." 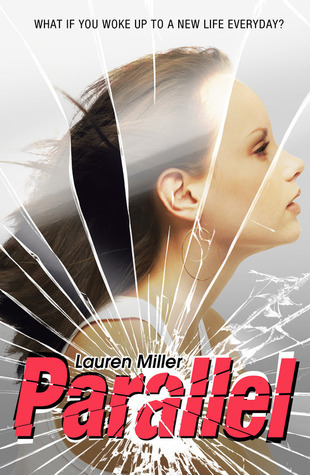 Overall, Parallel was a fun read that drew me in mainly because of the plot. I wasn't really a fan of Abby's personality but i think that was because we didn't get enough time to actually come to grips with her personality. The author was a complete genius when it came to explaining the whole idea of the 'parallel' worlds concept and the ending..oh the ending! Fantastic review, Hawwa! I love reading your writing :) This book sounds quite good even though you found some parts tricky to connect with. I don't think I've read any books about parallel worlds but I love the concept of them. Those quotes are beautiful! *adds to Goodreads quote list* Thanks for sharing! Is this the UK cover? I don't think I've seen it before! I wasn't too sure about this book, but it sounds pretty good overall. Lovely review, Hawwa.